Errol brick and tile works, Inchcoonans tileworks, Errol Brickworks. Inchcoonans Tile Works, Errol, Perthshire This works was built to manufacture agricultural drainage tiles, but also made plastic-clay bricks, and probably also pantiles for roofing. In 1976 it had two round downdraught kilns, one rectangular downdraught kiln and a small Hoffman brick kiln. Inchcoonans Tile Works, 19th century. A notable group of circular and rectangular kilns, with four square-section chimney stalks, drying sheds and other buildings. Though rail transport is no longer used here, a ‘jubilee’ tip wagon is preserved as a flower container outside the office. Errol brickworks, formerly Inchcoonans Tile Works. Pre-1863 – 1990, closed. Kilns: 1 rectangular downdraught, 2 round downdraught, 1 tunnel type, 1 modern shuttle kiln. G Douglas and M Oglethorpe 1993, visited 1979. 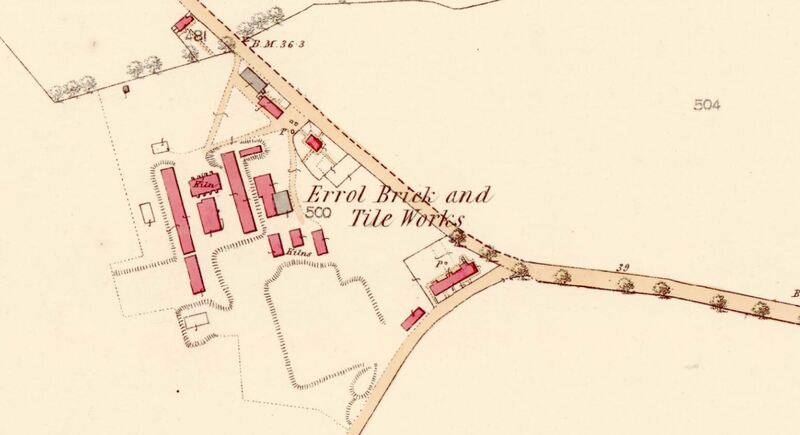 The First Edition of the OS 25 and 6-inch map (Perthshire, 1866, sheet 99.6), depicts the brickworks as roofed and annotates it as ‘Errol Brick & Tile Works’ also annotating a ‘weighing machine’. 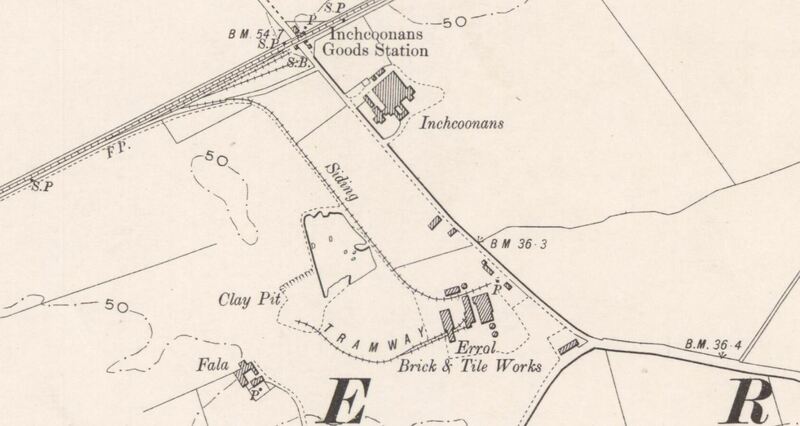 By the date of the 2nd edition (ibid, 1901-1902), the map shows a tramway running from the associated clay pit to the works and the addition of a standard gauge railway siding from near the level crossing and former goods station to the NW (NO22SW 84). 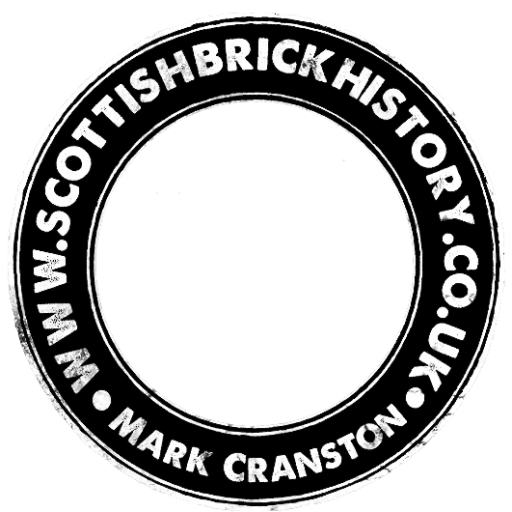 Info from wolfism – This site was worked from the 1870’s as a tileworks by the Pitfour Patent Brick and Tile Co. – it was owned from 1910 by the same firm (A. Fraser Ltd.) that owned the Anniston Brickworks in Angus – and eventually shut in 1990. 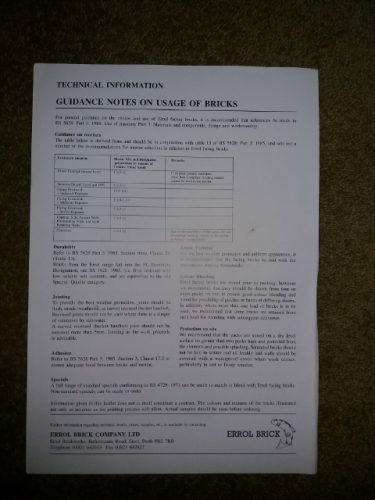 It was reopened in 1994 by an independent firm, Errol Brick, run by Martin Dighton and Andrew Clegg, but had to be mothballed in March 2008 during the current downturn in the construction industry. 27 staff were made redundant. 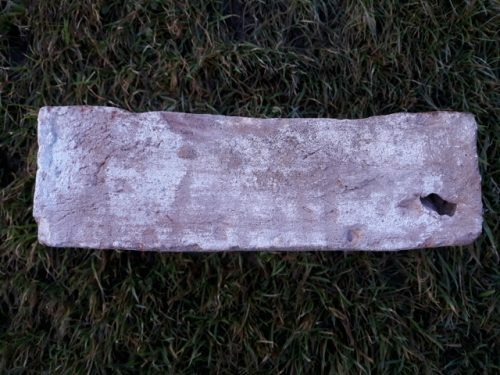 The brickfields were the oldest active fields in Britain – working a shallow pit of alluvial clay in Bevershire, on the north bank of the River Tay. In fact, Andrew Clegg proved that brickmaking was introduced into Britain on Tayside by the Romans, who produced bricks for their army’s thermal baths at Inchtuthill in the 1st Century AD, then clamp-fired them to produce thousands of 50mm lozenges. 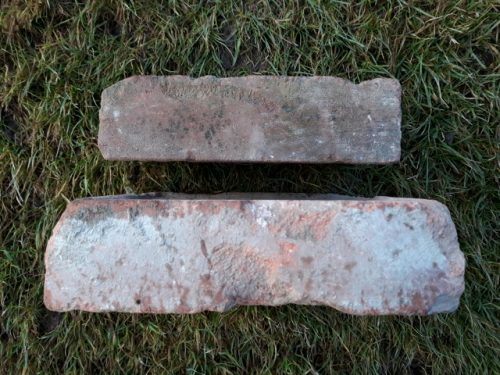 Handmade bricks from the carse were supplied to build the Old Bell Mill at Stanley in 1785 – the oldest formal contract fulfilled by the brickworks, although bricks and tiles had been produced at the site since 1690, or before. 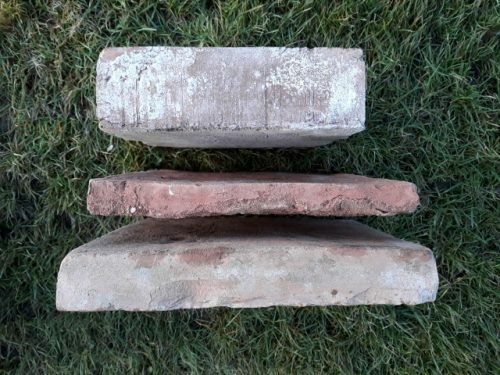 For years, the handmade bricks made at the site from unmilled clay were colloquially known as “piggery bricks”. The clay was once dug out by hand, later a narrow gauge railway was used to move it, then latterly the brickmakers used a Cat D6 bulldozer, plus a tractor and bogie. 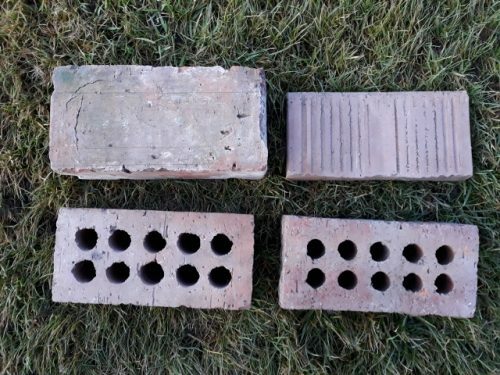 Once dug from the brickfield, the clay was stockpiled during the summer, then “grogged” with sand – the mixture was milled to a particle size of 2mm, then extruded and chopped into perforated and wirecut bricks or tiles. The chocolate-coloured “green” bricks are then moved into the drying chambers, then once dried, they’re moved onto the steel rail cars which carry them into the kiln. The natural gas-fired kilns are brought up to temperature over a period of 72 hours, reaching 1050deg.C: the continuous tunnel kiln normally runs for 24 hours per day. The brickworks has one rectangular downdraught kiln, now out of use, and two circular “beehive” kilns (long out of use), with one converted into an exhibition space. The active parts were one modern shuttle kiln, and one modern tunnel kiln, using metal cars running on rails with a deck made of refractory blocks like giant firebricks. 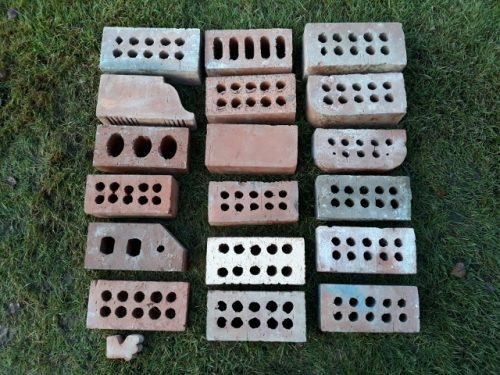 Latterly, Errol Brick had a capacity of 10 million extruded bricks each year and uniquely rather than fireclay or mudstone blaes, Inchcoonans brickworks used alluvial clay. 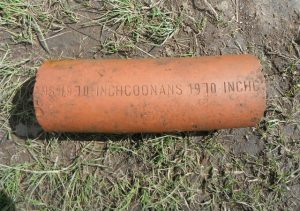 Technically known as late Devensian marine clay, it had some unique properties. 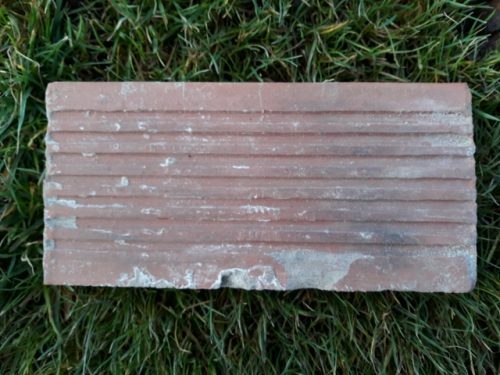 As a result of oxidisation in the kiln, the fired bricks turn from brown to an orange-red colour – facing bricks, floor tiles and engineering bricks were amongst the thirty types of brick manufactured here: but the mainstay were the frostproof “terracotta” bricks which were used at Stirling Castle, the Museum of Scotland, the Palace of Holyrood and many other historic sites – the brickworks latterly concentrated on bricks for conservation and restoration projects. 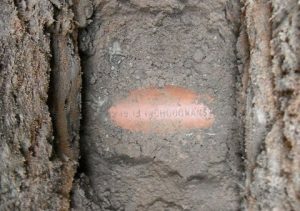 Puddle clay dug straight from the banks of the River Tay was also sold, and used for lining lochs and canals, and capping landfills. 26/10/1848 – Perthshire Advertiser – Drain tiles and bricks. 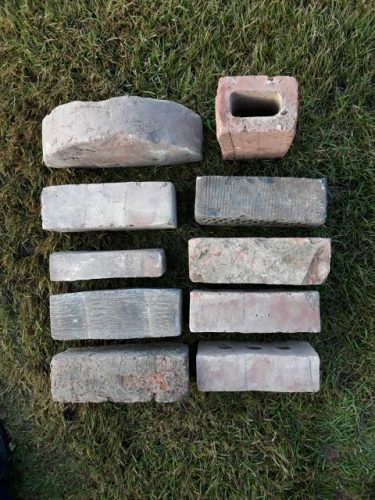 – The subscribers beg to inform their friends and the Public in general that they have on hand a very large and superior stock of different sizes of drain tiles and bricks and being near the railway they can be sent either to Perth or Dundee where they may be forwarded to any place required. J & H Adam, Errol brick and tile works, Carse of Gowrie. 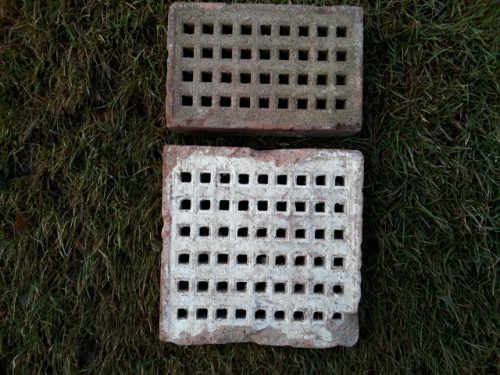 26/12/1849 – Dundee Courier – Drain tiles and bricks – The subscribers beg to inform their friends and the Public in general that they have on hand a very superior stock of common, leading and ditch tiles; also bricks and being near to Dundee and Perth Railway they can be forwarded to any Station required on the adjoining railways. 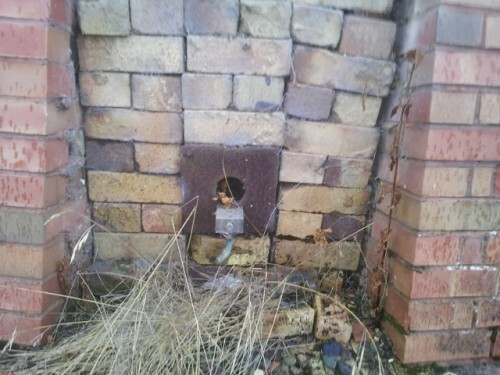 J & H Adam – Errol brick and tile works, Carse of Gowrie. 01/09/1854 – Dundee, Perth and Cupar Advertiser – Dundee and Perth Railway Station, Dundee 25/04/1854. 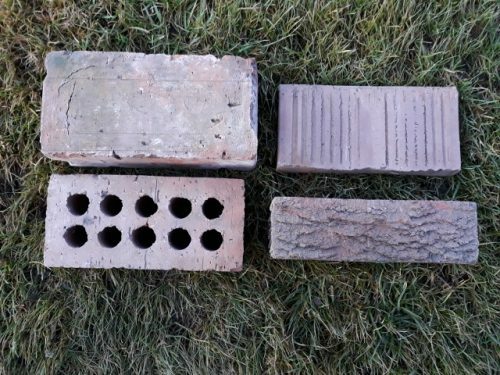 The Inchcoonan bricks are now ready. A stock will always be on hand. Robert Small. 03/08/1858 – Dundee Perth and Cupar Advertiser – Visit to Errol brick and tile works. The numerous brick buildings recently erected, or in the process of erection, in this quarter, betoken the existence of a brick manufactory in the vicinity. This is the most extensive branch of industry in the place, giving, at present, employment to above 150 persons. 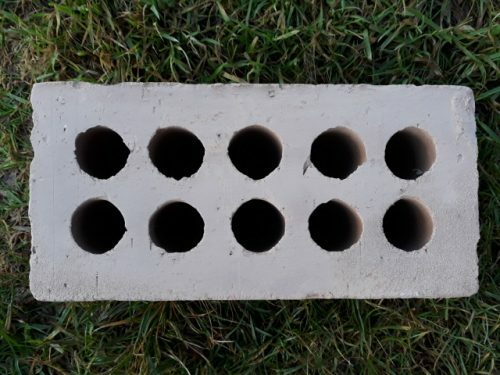 The improved processes of husbandry have given rise to a great demand for tile for drainage and other agricultural purposes, and in consequence, the works have greatly extended their operations within the last few years. The proprietor at present has an extensive contract with the Police Commissioners of Dundee for supplying brick for sewage purposes. Eight “tables” are constantly employed just now solely in making brick. , each table turning out between four and five thousand bricks daily. 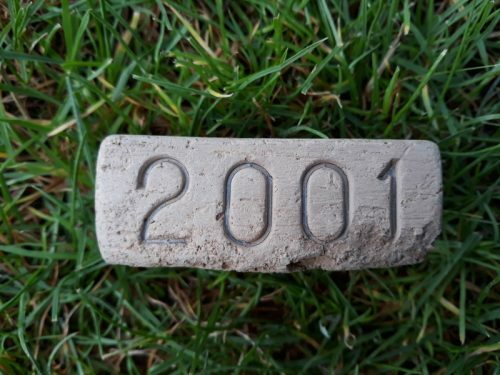 Estimating the weekly quota at 200,000 and the value at 25s per thousand, this will represent no less a sum than £1000 monthly, as the value of the brick produced here. The tile-pipe, of which so much is now used, is made by forcing the clay, through moulds of the required dimensions by means of a hand-machine, and then cutting it with a wire frame into roper lengths. 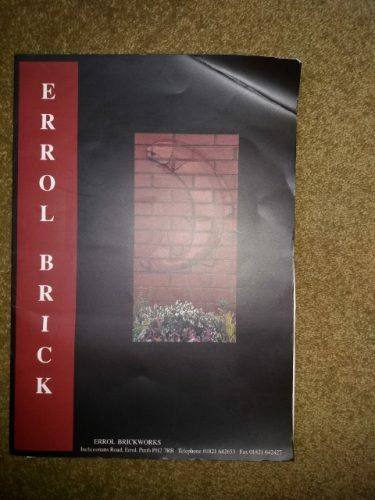 Altogether, a visit to the Errol Brick and Tile Work would amply gratify the intelligent and inquiring. 02/06/1876 – Dundee Courier – Wanted a few good workmen, also a brick burner at Errol Brick Works. Apply to the Manager. 30/07/1879 – The Dundee Courier – The Agricultural Show, Perth – At stand 158 (John Doe’s), Adamson & Co of Dundee and Errol exhibit a very fine selection of agricultural drain tiles from 1 1/2″ to 142 in diameter and also roofing tile, pressed brick, cut and hardware. These are all being extensively used by agriculturists and are entitled to practical patronage from farmers and others in want of such material, alike from their clean make and finished, yet substantial workmanship. The firm also exhibit examples of Portland cement and an apparatus for testing its tensile strength, compactly made, and very useful. 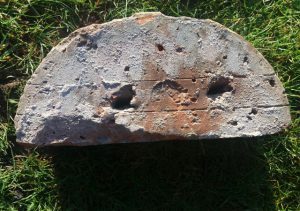 One of the cement blocks we saw tested only gave way on a pressure of 1180lbs. The whole of the articles are well arranged, and reflect credit to the firm. 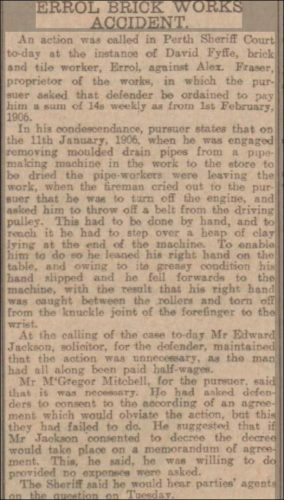 Below – 16/03/1906 – Dundee Evening Telegraph – Court case following an injury to an employee. 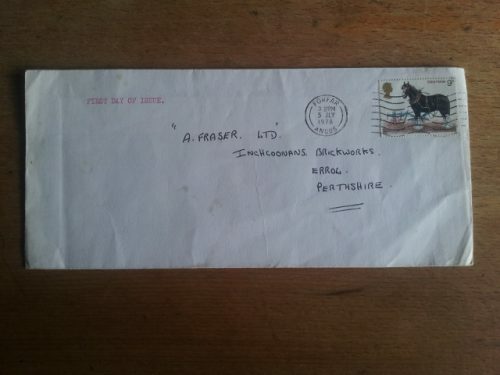 Alexander Fraser proprietor. 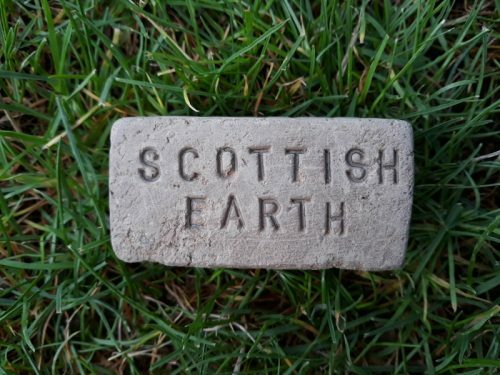 Below – 22/08/1924 – Death of Mr A.B.S Fraser, Brick manufacturer of Fala, Errol, and of Wester Tullyfergus, Alyth. Mr William Johnstone, Manager. All Parties having claims against the late Mr A. 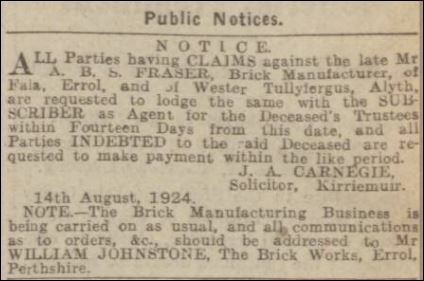 B.. S. Fraser, Brick Manufacturer, of Fala, Errol, and of Wester Tullyfergus, Alyth, are requested to lodge the same with the subscriber as Agent for the Deceased’s Trustees within Fourteen Days from this date, and all Parties indebted to the aid Deceased are requested to make payment within the like period. J. A. Carnegie, Solicitor, Kirriemuir. 14th August, 1924. 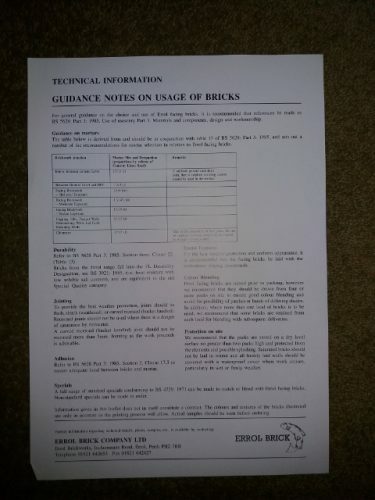 Note – The Brick Manufacturing Business is being carried on as usual, and all communications as to orders, &c., should be addressed to Mr William Johnstone, The Brick Works, Errol, Perthshire. Warrant for citing the said Robert R. Dewar to appear in Court on the seventh day next after citation, to show cause why sequestration should not be awarded; of all which Intimation is hereby given. Walter A Dickson, Law Agent, 10 Blackfriars Street, Perth. Perth, 25th November 1935. 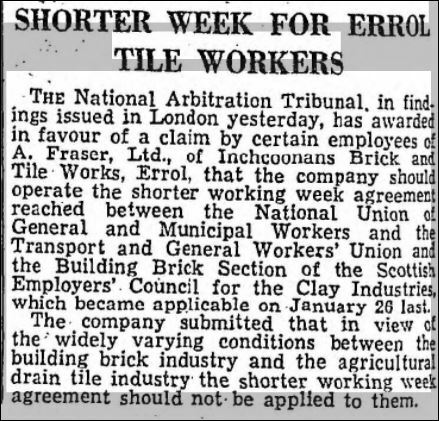 Below – 15/07/1948 – The Scotsman – Shorter Week for Errol Tile Workers. Below – 07/07/1950 – A.Fraser ltd, Inchcoonans brick and tile works, Errol advert. 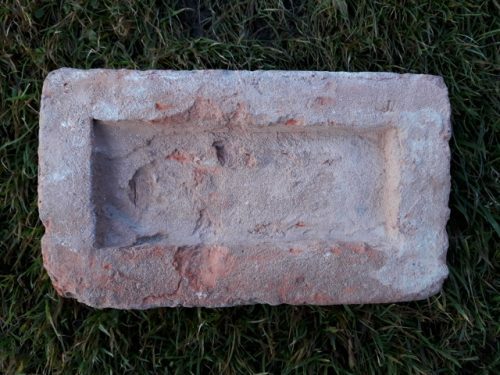 Below – this unfired brick was found within one of the kilns at Errol. 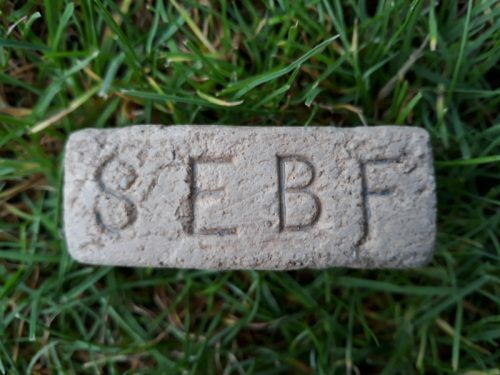 I believe it to be an ECO brick as per above. Many thanks to Stephen Urquhart who is the site manager at Mackies Crisps who currently are based on the old Inchcoonans Works. 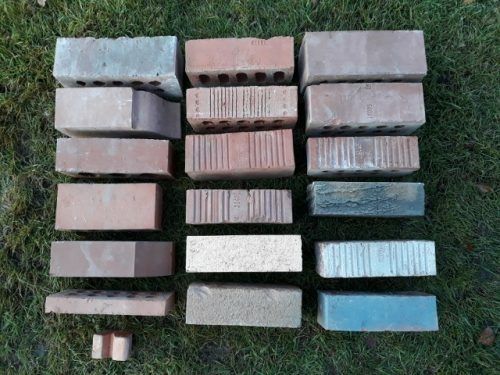 He donated many examples of bricks believed to have been manufactured on site. A search of the edges around the site revealed many more. 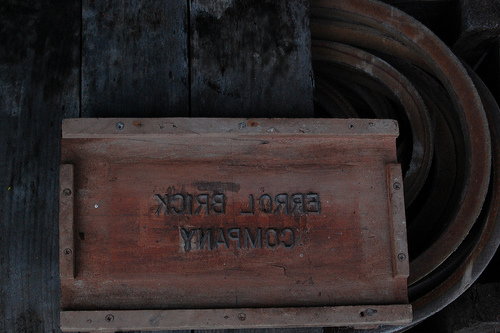 Below – some of the earlier products believed to have been manufactured at the Errol Works. 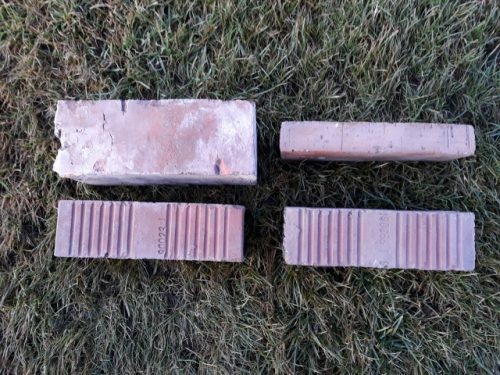 The lower photo is of the same bricks as the photo above it but the bricks are on their sides. 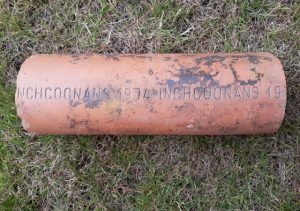 16/03/2015 – Graham Douglas, co author of Survey of Scottish brickmarks 1985 relates the following: – When carrying out a visit to the Inchcoonan / Errol works in 1985 I was told an anecdote regarding Inchcoonan drainage tiles. The works used to mark their tiles with Inchcoonan and then the year of manufacture. 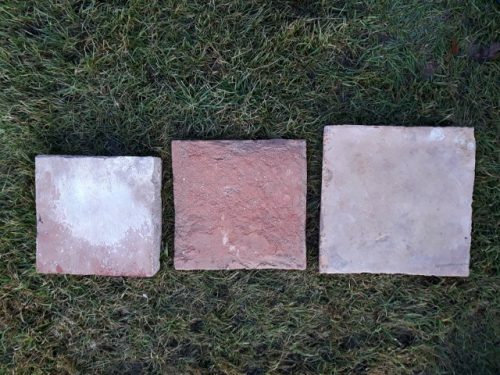 A farmer ordered a number of tiles for draining a field and was quoted a price. He then noticed the year stamp on the tiles which was the previous year and apparently before a large hike in the oil price. He demanded a reduction in price for the tiles as he said they would have been cheaper to make than ones following the oil price rise. In the end he got his way but since that date (unknown but after 1975) Inchcoonans never year stamped their tiles again. – Shrewd cookies these farmers! 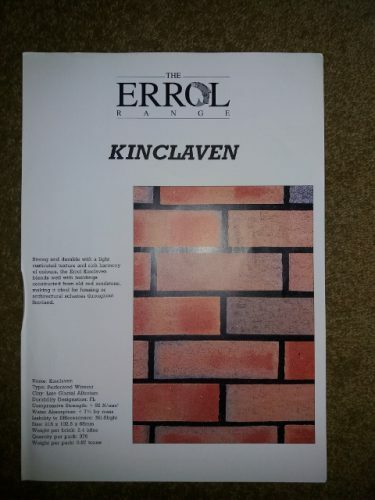 Source Perth & Kinross Council Archive – They state… The Third Statistical Account for Errol mentions that an industry in pottery and brick and tile manufacture commenced at Inchcoonans in 1855. 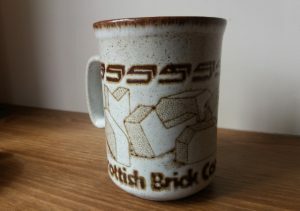 The pottery side did not survive long, but about a 100 years later the brick works still employed about 20 men full-time. 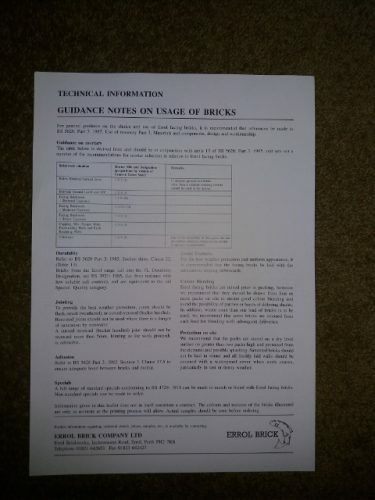 We have some letters from the Dundee Brick & Tile Co, Errol to a firm in Derby, 1936-1938 (MS240) and various applications for planning permission by A Fraser (Brick and Tile Manufacturers) Ltd concerning the Inchcoonans Brick and Tile Works, Errol, 1948-1957. 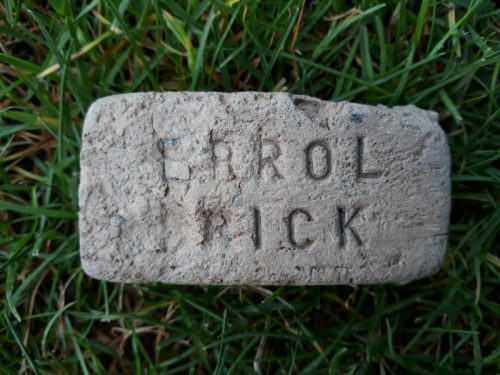 Latterly the company seems to have traded as the Errol Brick Co Ltd and carried on until about 2008 under the management of Andy Clegg. We also have a draft lease between Lord Kinnaird and Alexander Thomson for the “Inchture Brick and Tile Works”, c.1853 (MS100/2 1083 and 1092), although the 1857 valuation roll just describes it as a tile work. Our online catalogue also gave me the name of Charles Wood, brick manufacturer, putting in an application about Craigie Public Hall, Perth in 1897. A look in the Leslie’s Directory for that year showed him as part of James Wood & Son, brick, tile and pottery manufacturers, Friarton, Perth. 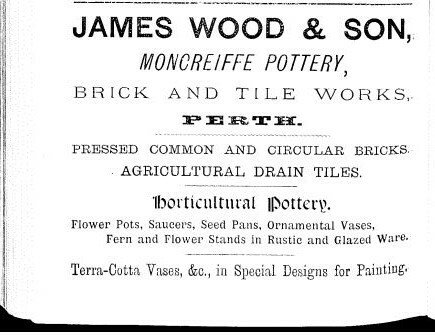 The directory also contains an advert for their Moncreiffe Pottery, Brick and Tile Works which I attach. Perhaps this was another name for the Friarton works. Moncreiffe Island was also known as Friarton Island, so it seems feasible. Scroll of a missive of lease from Thomas Hood to Lord Kinnaird for the farm of Newton Bank, 1817. 13 September 1851, James Condie, Perth to Lord Kinnaird. 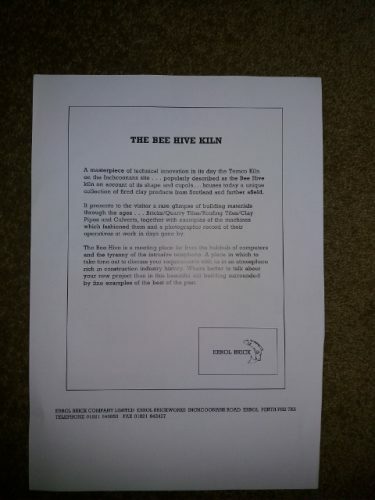 Relates to the fishing marches between Lord Kinnaird’s estate and the Castle Huntly Estate. Offers and draft agreements between Lord Kinnaird and James Webster for the tile works at Newmains, 1843, 1846. 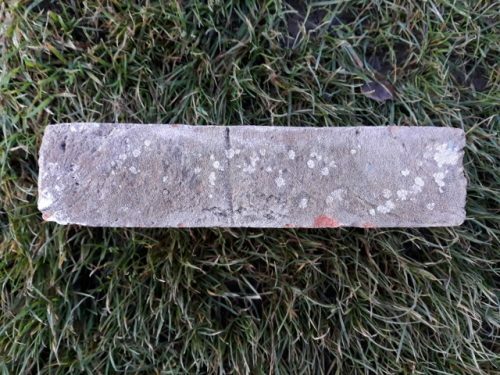 Draft tack for the brick and tile works at Newmains, n.d.
MS240/1 – 16/11/1936 – Letter from The Dundee Brick & Tile Co Ltd to Bennet & Sayer Ltd re production contract and number of bricks per hour. 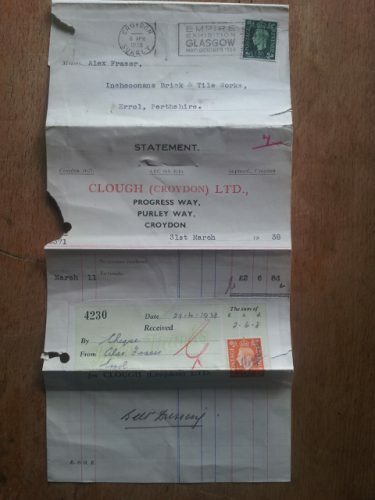 MS240/4 – 18/11/1936 – Carbon copy letter from Bennet & Sayer Ltd to The Dundee Brick & Tile Co Ltd re cost estimate for new clay brick mill, including specifications. 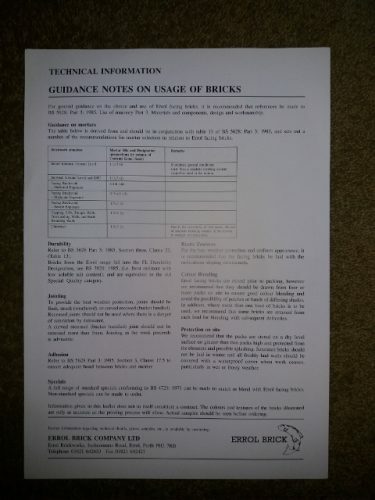 MS240/5 – 23/11/1936 – Letter from The Dundee Brick & Tile Co Ltd to Bennet & Sayer Ltd re receipt of sample bricks. Rear is annotated with handwritten pencil notes regarding temperature of brick fire. 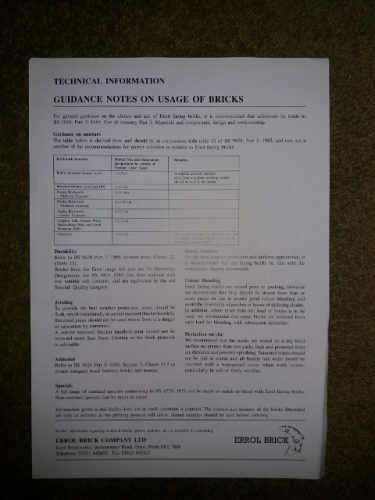 MS240/8 – 09/03/1937 – Letter from The Dundee Brick & Tile Co Ltd to Bennet & Sayer Ltd at Nuns Foundry, Derby, confirming that The Dundee Brick & Tile Co Ltd do not intend to proceed with the wire cut system of brick making and will continue with mud press system owing to wet quality of their clay. 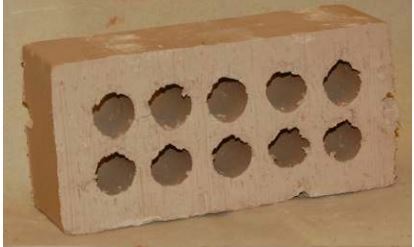 We manufacture clay facing and engineering bricks to FL quality. Smooth, rustic or antique textures are available in 65mm, 73mm & 80mm dimensions. Terracotta red, brown and multi are the colours our clay produces. Puddle Clay is readily available for the lining of landfills to flood defense works. The TEMCO kilns were last used in 1986, since when the eastern example has been converted to a museum and plans are currently (2000) afoot to restore that to the west. The method of firing from the side led to massive heat variation, with the sprung roof expanding by 1.5″. The beehive kilns were capable of holding from 10,000 – 100,000 bricks per load, and were also used in the production of large drain pipes. 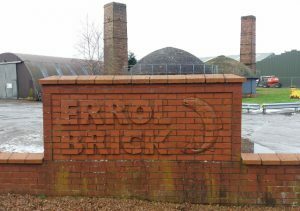 Errol Brick Company is the only survivor of a group of nineteenth century brickworks in the area: the others were Pitfour Patent Brick Company, Megginch, Waterybutts and Nether Mains of Inchture. Errol (Inchcoonans Tile Works) Brickworks opened in 1855 producing pottery (a short lived venture), bricks and field drainage tiles. Using local alluvial clay, brick making was introduced by the Romans, and revived in the sixteenth century by traders from the Low Countries. The parish has examples of brick farmhouses dating from the late 18th century, with a rare mid century survival at Flatfield; steadings were not built of brick until the early 19th century. The kilns at Errol Brick Company comprise: 1 rectangular downdraught kiln, 2 round downdraught kilns (see above), 1 tunnel kiln and 1 modern shuttle kiln. 1983 – When Whatlings purchased A Fraser Brick and Tile Works Errol in 1983 from Peter Baird, Colin McNeil was appointed Director of that Business and for the next 6 years [ including through A McAlpines ownership – McAlpine purchased Whatlings in 1985] he oversaw the investment of CGE Shuttle kiln, Lingl Tunnel kiln, most of the buildings associated with the manufacturing process and various other new equipment. 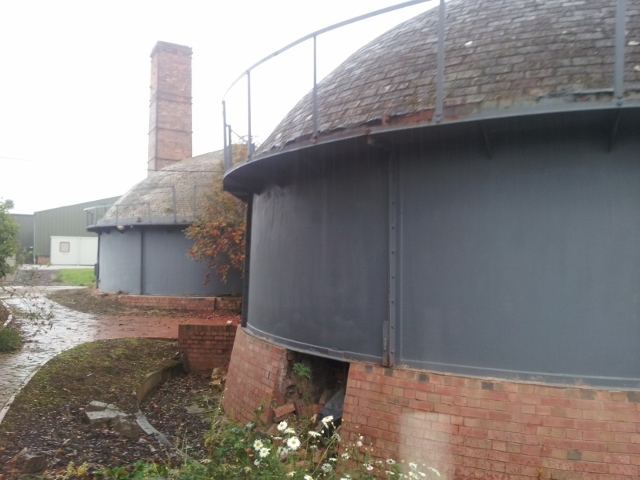 During this time a museum within one of the Tempco beehive kilns. It is significant also that the establishment of that investment resulted in our negotiation with Scottish Gas to install a Gas supply pipeline to the Works, which of course has benefited successors and neighbours. 1988 – In keeping with its restructing program, Alfred McAlpine PLC sold its Scottish brickmaking works, in Errol, Perthshire, to Marley PLC for $5.4 million.29 This acquisition, Marley’s first in Scotland, produces a full line of facing and engineering bricks and tiles. The newly operational Lingl tunnel kilns are currently producing about 10 million bricks per year, all from locally derived clays. 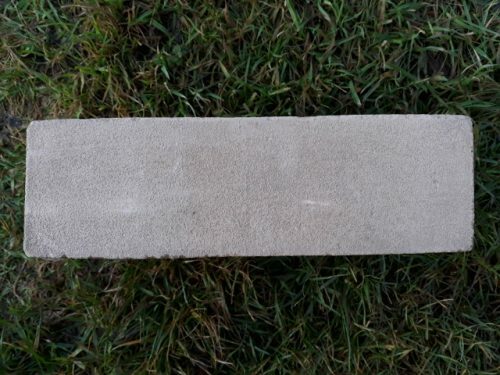 Marley plans to expand the market area for the company’s bricks into northern England. 2010 – The Errol Brickworks, which had provided a source of local clay from the Gallowflat claypit, as well as a location for processing materials, closed in 2010. 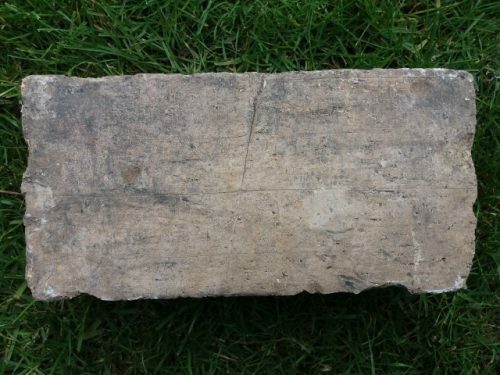 Below – 3 floor tile of various size. 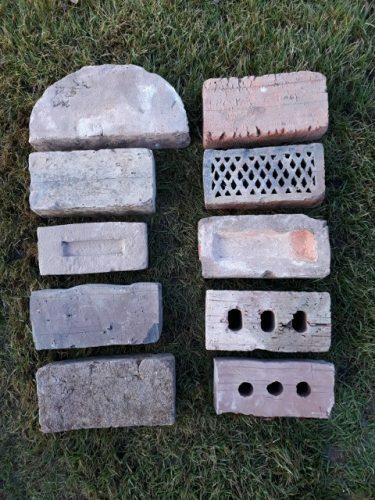 Below – a selection of 4, Errol manufactured bricks donated by John Logie who used to work on the site. 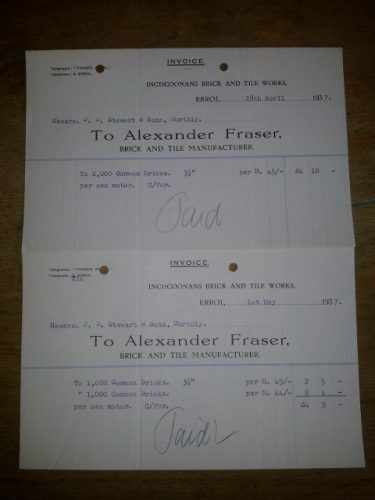 Below – 2 invoices dated April and May 1937 – Alexander Fraser, Brick and Tile Manufacturer, Inchcoonans Brick and Tile Works. 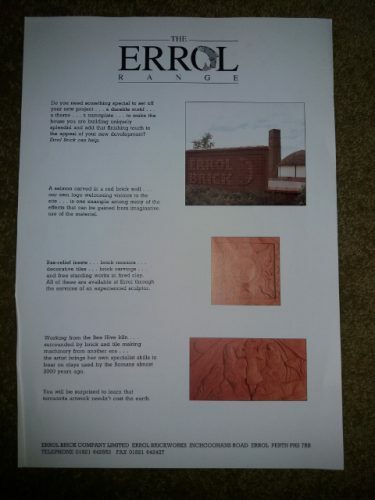 Jan 2017 – I had the pleasure to speak with John ( Jock) Logie from Errol. He worked at the brick works from 1962 – 2004. In 1962 the works seemed to concentrate on drainage pipes although they were making bricks too. 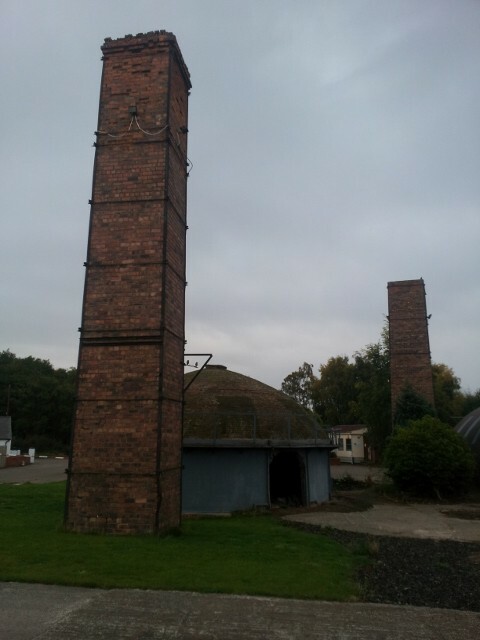 At this time the works were owned by Captain Wemyss , Wemyss Castle, Fife and of the Wemyss Coal Co Ltd.
Mr Logie remembers at this time that there was a Hoffman kiln on site with 6 chambers down each side, 2 ‘square’ kilns and 3 ’round’ kilns – 1 large and 2 smaller. Alfred McAlpine took over after Wemyss and then Marleys before Andrew Clegg, Martin Dighton and Michael Challoner in the 1990’s. He also recalls the works being owned by ‘Watlins’ at some point. There was also at some point a fire brick works near Grange just to the north east of Errol. There was a clay pit and kiln there and they manufactured buff coloured, unstamped, fire bricks. It was apparently described as a ‘brick works before its time’ ( I cannot find this on any of the old maps I have access to). 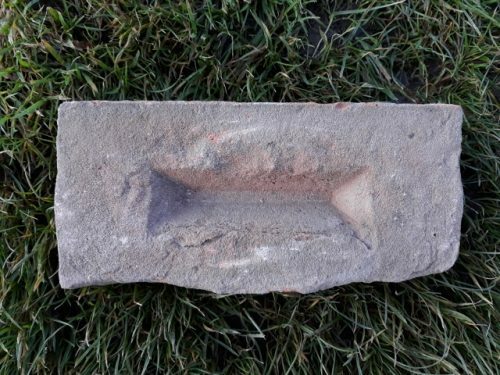 However there were a number of these unmarked fire bricks lying around the Errol Brick Works and I believe these may be the product of the Errol – Grange Fire Brick Works. The following photos were taken of a brochure and retirement presentation in the possession of Mr Logie. 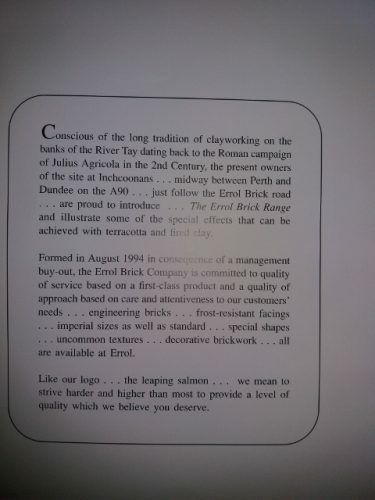 Below – Conscious of the long tradition of clay working on the banks of the River Tay dating back to Roman campaign of Julius Agricola in the 2nd Century, the present owners of the site at Inchcoonans… midway between Perth and Dundee on the A90 … just follow the Errol Brick road … are proud to introduce … The Errol Brick Range and illustrate some of the special effects that can be achieved with terracotta and fired clay. 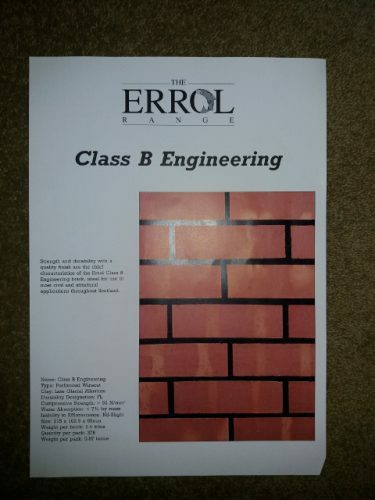 Formed in August 1994 in consequence of a management buy-out, the Errol Brick Company is committed to quality of service based on a first-class product and a quality of approach based on care and attentiveness for our customers’ needs … engineering bricks … frost-resistant facings … imperial sizes as well as standard … special shapes … uncommon textures … decorative brickwork … all are available at Errol. Like our logo … the leaping salmon … we mean to strive harder and higher than most too provide a level of quality which we believe you deserve. Do you need something special to set off your new project . . . a durable motif . . . a theme . . . a nameplate . . . to make the house you are building uniquely splendid and add that finishing touch to the appeal of your new development? 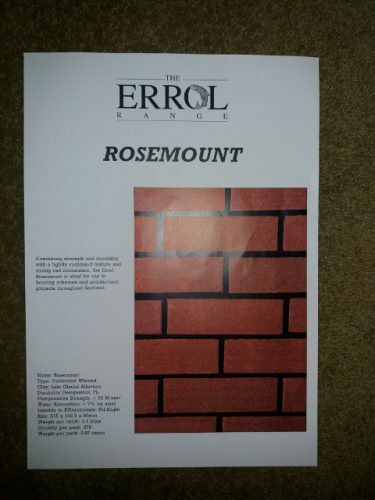 Errol Brick can help. 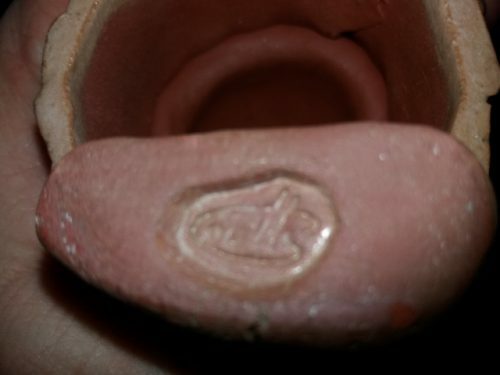 A salmon carved is. a red brick wall our on logo welcoming visitors to the site . . . is one example among many of the effects that can be gained from imaginative use of the material. Bar-relief insets . . . brick mosaics . . . decorative tiles . . . brick carriage . . . and free standing works in fired clay. All of these are available at Errol through the service of an experienced sculptor. Working from the Bee Hive kiln . . . surrounded by brick ad tile making machinery from another era . 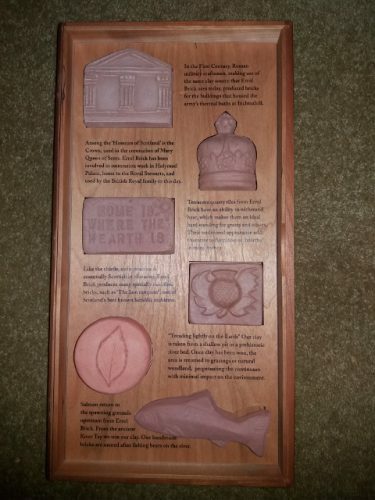 . . the artist brings her own specialist skills to bear on clays used by the Romans almost 2000 years ago. You will be surprised to learn that terracotta artwork needn’t cost the earth. 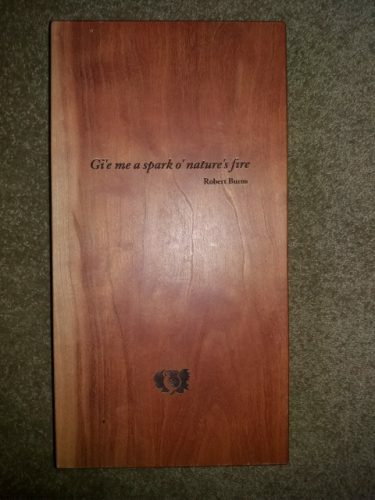 Below – a presentation case given to Mr Logie on his retirement. 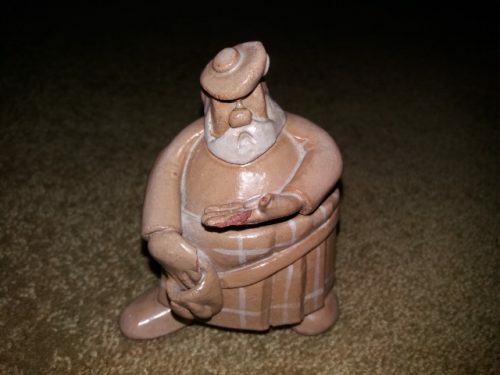 Below – Mr Logie states that these 4″ tall clay figures were made by Robert Coutts of Invergowrie. They formed the ‘wee men of glaur’ series. 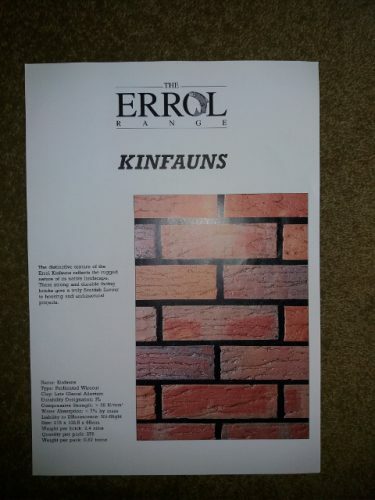 Apparently the Errol brick salesmen and agents would give these away to customers. 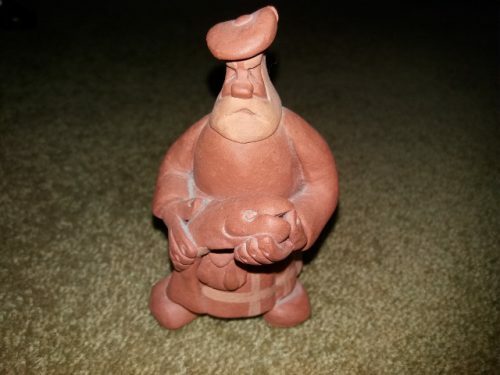 They were hand made around the 1950 – 1970’s. Mr Coutts died around 2001. 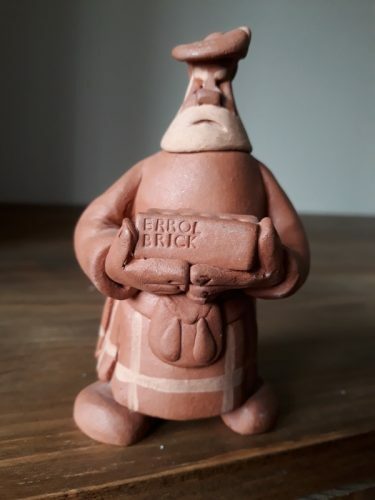 Below – This Wee Man of Glaur was undoubtedly maufactured for Errol Brick Works and is probably the example that Errol Brickwork agents gave away to customers. 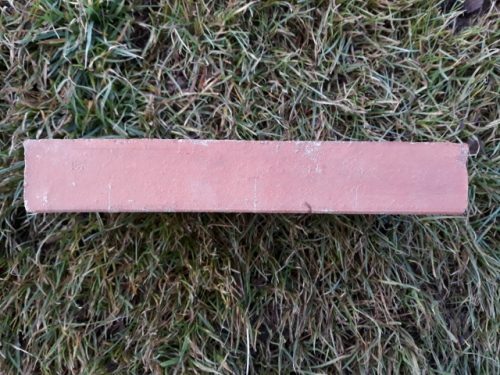 The brick has 10 cores as per Errols Eco brick. 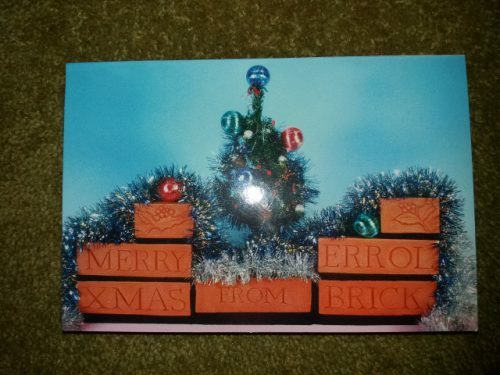 Below – Christmas card from Errol Brick Works. 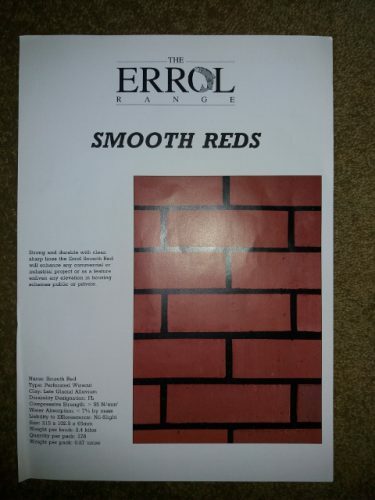 It also appears to be made from the same material as the Errol Eco bricks. It is also unfired as per the Eco bricks. This was kindly donated by Nick Basden. Found by Ian Suddaby in Forfar. The drain is located 1m underground. Errol Brick and Tile Works, Inchcoonans, Dundee . . .
Winchburgh Brickworks, Winchburgh, West Lothian Canmore 1869 -Alexander Dougal & Son, brick & fire-clay goods merchants, 19 Port Hamilton & 100 Fountain bridge. 15/05/1875 – Alloa Advertiser – Deaths – At Winchburgh Brick Works on the 8th inst, Janet H Hunter, the beloved wife of Mr John Stein, in the 40th year of her age….